The return of the Volvo World Match Play Championship to U.K. soil in its 50th anniversary year looks certain to create an exciting atmosphere at the London Golf Club’s International Course by Nicklaus Design. During the event, 16 of the world’s best players will compete in match play, an exciting format still fresh in minds just two weeks after the Ryder Cup and Team Europe’s win on the Jack Nicklaus-designed PGA Centenary Course at Gleneagles in Scotland. The Volvo World Match Play Championship will be played Wednesday through Sunday with Group Matches held through Friday, Quarterfinal matches on Saturday, and the Semifinal, Final and consolation matches taking place Sunday. TV times on the Golf Channel are Thursday from 7:00 a.m. to 11:00 a.m. EDT; Friday and Saturday from 3:00 a.m. to 6:00 a.m., as well as 8:00 a.m. to 11:00 a.m. EDT; and then Sunday from 3:00 a.m. to 11:00 a.m. EDT. Having hosted the Regional Open Qualifying and European Tour Qualifying School, the International Course at London Golf Club proves a tough test for the most talented of golfers while providing the opportunity to shoot some great scores with a number of risk-reward holes. The International Course is pure “downland.” Long grasses sway in an ever-changing breeze. The course is naturally firmer and the quick undulating fairways force a links-style approach, while short holes over water provide dramatic respite. 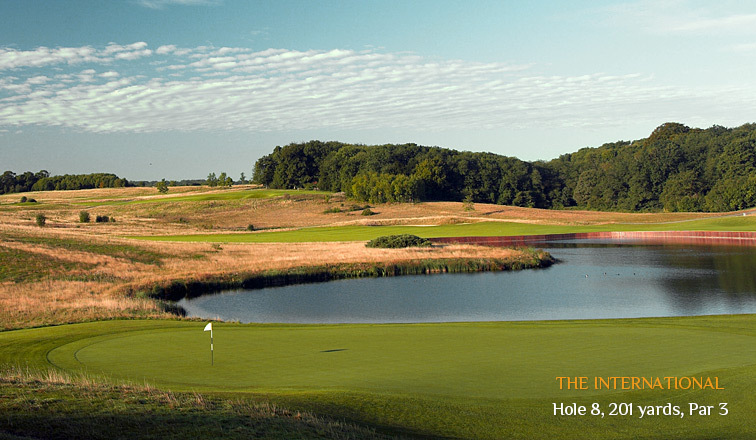 London Golf Club is home to 36 holes of Nicklaus Design golf, as Jack Nicklaus created the Heritage layout in 1994. Competing in this week’s event are nine of the world’s top 50 players, with all 16 players ranked within the top 90. Between them, they have won more than 115 professional titles. Six of the players in this week’s field competed in the Ryder Cup—Jamie Donaldson (Wales); Victor Dubuisson (France); Stephen Gallacher (Scotland); Graeme McDowell (Northern Ireland); Henrik Stenson (Sweden); and Patrick Reed of the US. Donaldson, Dubuisson, Gallacher, Stenson and McDowell found themselves on the winning side at Gleneagles, while Reed was the U.S. Team’s star performer, earning 3½ points out of four, including a win in his singles match against Stenson. Other players in the field include Jonas Blixt (Sweden); Paul Casey (England); George Coetzee (South Africa); Mikko Ilonen (Finland); Thongchai Jaidee (Thailand); Pablo Larrazabal (Spain); Alexander Levy (France); Shane Lowry (Ireland); Joost Luiten (Netherlands); and Francesco Molinari (Italy). The World Match Play’s rich history includes a who’s who of victors: Jack Nicklaus, Arnold Palmer, Bob Charles, Tom Wieskopf, Hale Irwin, Greg Norman, Seve Ballesteros, Sandy Lyle, Nick Faldo, Ernie Els, Vijay Singh, Corey Pavin, Lee Westwood, Ian Poulter, Nicolas Colsaerts, and defending champion Graeme McDowell. Nicklaus won the 1970 final 2 and 1, when the matches were held at Wentworth Golf Club in Virginia Water, England. This year’s Championship is run in conjunction with Volvo, IMG and the European Tour, and features a prize fund of €2.25 million and a first prize of €650,000. The London Golf Club is the only Joint Venture Partner Golf Club of The European Tour and a part of the prestigious European Tour Properties network and IMG Prestige.